‘Tis the season for me to obsess about costumes. For most of the year my crafting obsessions are largely to do with gifts, or sometimes a new thing for home or everyday apparel. But in June, just before my favorite (and sometimes only) gaming convention of the year, I think obsessively about what new technique-y thing I can learn to make my costume-idea-du-jour the most awesome. Every year, I try to add a few new things to the costumes I wear to the June gaming convention. This year, I have too many ideas left over from last year, plus new ideas. Last year’s innovations included prosthetic ears, wigs that I learned to style myself, and a new bustle and overskirt. And the effect was awesome! Also, I have since realized, that I’m not just a person who attends convention in costume, I am a cosplayer. I didn’t realize until last year, that cosplayers weren’t some special people doing something different than me, it’s a thing I also do. If you, like me, don’t know much about the word “cosplay”, it means that you like to dress up in costume just for fun (probably at appropriate venues, where other people are in costume, like a geek-culture convention of some sort), beyond something you would do for work (say, if you worked at a museum), beyond historical reenactment activities, and beyond halloween. You just like to assemble and wear elaborate costumes (you can buy or make them). And it doesn’t have to be a costume representing a specific character from a movie, graphic novel or book (another area in which I was confused). So far, I dress up in costumes as a character of my own creation. But down the road, I have a vaguely formed wish to make a costume to represent each of the Pathfinder Iconics in a victoriana-ish style, just to meld together some disparate geek passions of mine. So I actually did accomplish a lot of new things on the costume front last year despite May having a nearly-walking baby to chase after, a husband finishing graduate school, a graduation, and getting the longest-lasting cold of my life. 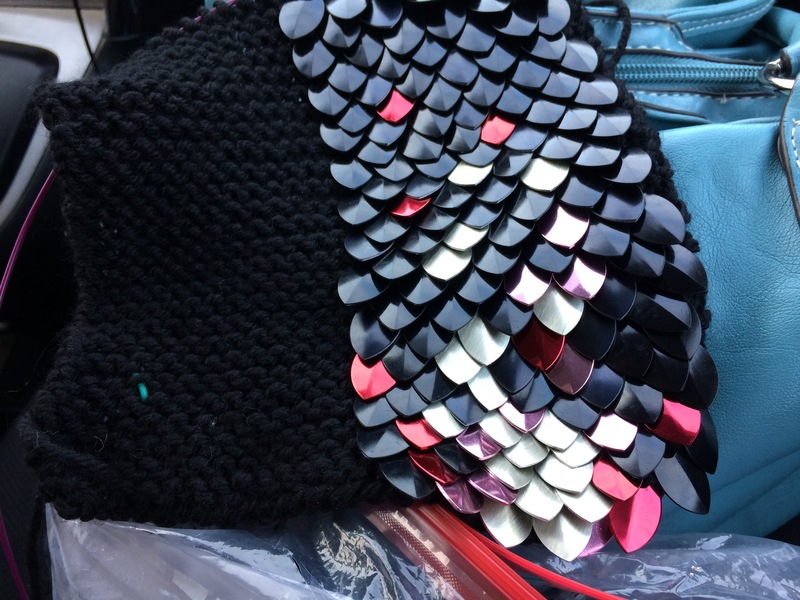 One of last year’s ideas that I never capitalized on was the idea of knitting with scales. The Crafty Mutt has some beautiful tutorials and patterns, and there are sellers on Etsy with finished projects for sale as well if you are intimidated by the idea of knitting with scales. From what I could find though, The Crafty Mutt seems to be the only one out there designing patterns for knitting with scales. 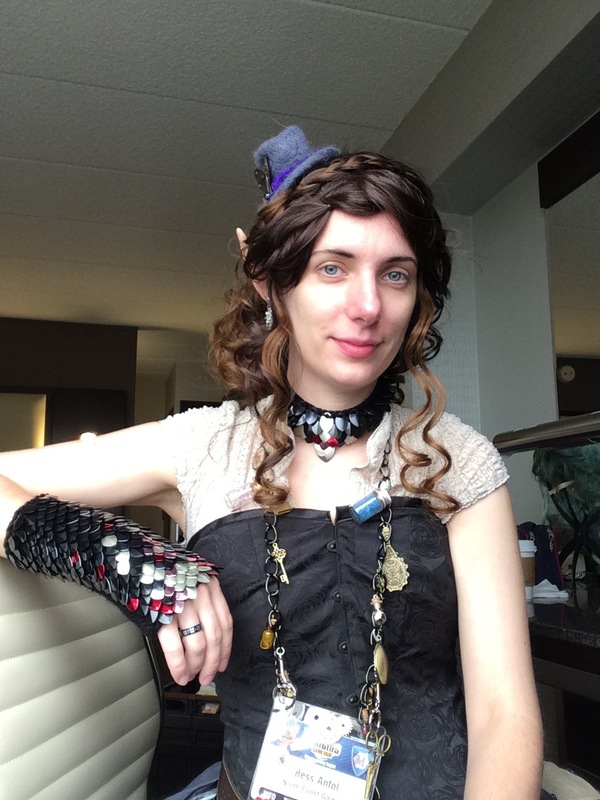 I picked up Crafty Mutt’s “Knitted Scale Mail Gloves” and “Scale Choker” patterns, and got myself a big sack of various scales from TheRingLord.com. Ready, set, knit! For the patterns I bought, the needed size was the “small” scales from TheRingLord.com (other places sell scales for scale-mail too, and their are some etched ones on Etsy, but this was the best place I could find good deals on bulk plain scales). I got some polycarbonate plastic and some aluminum. They are all very lightweight individually, but since I was buying online, I couldn’t be sure, so I planned my project to be mostly comprised of black plastic scales. I don’t think it will matter for the gloves so much, but I also have a notion to convert the design into knitted scale spats, and I think at that quantity, and because they would be worn vertically, the scaled material might be too heavy for the fabric and sag. I also went mostly plastic because they are much cheaper: bag of 1000 plastic was $0.01 per scale vs. aluminum which are about $0.03 per scale. I figured that even if I hated knitting with scales, I could probably make some jewelry out of the metal ones, so I did get a variety of small packs to experiment with, as well as a sampler pack of different sized scales. Not nearly as difficult as I feared. I’ve never even knitted with beads before (although I always fancied that I would at some point). The hole on the scales is pretty huge, so even though you stick your needle in the hole and pull the yarn through, it’s not too difficult. I had some trouble getting the scales oriented the way I wanted on my swatch, but figured it out half-way through. Crafty Mutt’s directions are really quite good, but it might be worth re-reading the section on scale orientation. I noticed that in some of the other projects that people show on Ravelry, their scales are sticking out funny. I had this problem too in my swatch, until I realized that I was not following the directions correctly. Each scale should be curved inward towards the fabric when you put it on the needle, but the act of pulling the stitch through flips the end-point of the scale to the wrong direction (vertically up instead of down). Before you knit the next stitch, you manually rotate the point downward and lock it in with the new stitch. When I did it this correct way, the scales hugged the fabric nicely, making the scales naturally lay in a nice smooth fashion. My tension on this project is also pretty loose and the non-scale fabric pretty squishy, so that may be a factor in them laying nicely too, but I think the biggest factor is how the legs of the stitch pull the scale down and inward when you get it right. Before long, I was whipping through the rows pretty fast. Since the fabric is just garter stitch, the yarn is worsted, and the scale-attachment is only for 6 stitches every other row, it really moves quite quickly. Happy day! I might get this part of the costume done before the convention! Even if I only knit during commutes! With a craft studio move planned for over the summer, I was given some birthday money to spend on craft storage solutions. This coincided with a sale at Michael’s on storage items, and I was able to pick up some of the Recollections line of storage cubes. I was intrigued by their relative cheapness per unit and modularity, but I thought I should test out one or two before envisioning some long-term project to line my entire future studio with these modules. In the box: Various panels, assembly hardware (screws, dowels), a drawer pull, and some decorative screw/dowel hole covers. Some assembly required: Let me preface this comment by saying that I enjoy assembling, following directions, I build with LEGO even as an adult, and I generally like putting things together. I found this overall FUN to assemble. The parts are all labeled, small hardware is in labeled bags, the instructions are very nice and clear, i.e., attach A to B using screws from bag #8. So easy. Everything was machined very precisely, I had no adjustments to make. The main parts of the cube were easy to assemble, although unlike with the last cube, I did have trouble screwing in the drawer-pulls on this cube. It felt like those pilot holes were not large enough or something. I have read a lot of reviews where people were very intimidated by the assembly of this item, or had difficulty with the assembly. I can only say that I had no major problems with the ones I have worked on. Quality of materials: I go on a bit about what MDF is, and how I feel about it in my first post on the Michael’s storage cube line. The short version is that I would have expected a little damage to the corners anyway due to the nature of MDF materials and the way these products are packaged. I was pleasantly surprised by the first cube’s relatively good condition, and entirely unsurprised that my “ding and dent” cube had some slightly crushed corners. I will also say that Recollections customer service was very kind and sent out replacement hardware for me with relatively little effort on my part, since my “ding and dent” cube was missing some screws and such. And to be clear, I don’t have a problem with some minor dings in my cubes, even if I had bought them at “regular” sale prices, because I expect that these cubes are not going to stay pristine in my working studio space. The one hardware issue is worth mentioning again – I didn’t even try the strange domed hole covers this time. I went straight for the little white vinyl stickers as an alternate solution to covering the holes. This worked just fine, and isn’t terribly noticeable, but again, some people might be disappointed by the look. Use: I haven’t put it through it’s paces over time yet, so I will update this later when I see how it holds up. My expectation with MDF is that if the unit is exposed to any flexion through rough use or moving while full (or disassembly, which I don’t intend), the screws would begin to strip the small particles within the screw holes. Over time, this would break down the units to a point of unusability, so I plan to be as careful as I reasonably can be when it comes to moving them around and ultimately moving them into the new space. With a couple of horizontal shelves, this cube has at last provided me with a place to store some 12×12″ paper pads. [Update: this may not be ideal for the paper pads either! See my note at the bottom of the post.] Because paper pads are so dense and heavy, I discovered that the Hanging File cube from Recollections is really better for loose 12×12 papers. Now that I’ve got a couple of these 12×12″ shelves, I might go for the 4-shelf organizer as my next cube purchase to give myself more room for those paper pads. But I think I better wait until I’ve moved my studio at this point, since I still have a rolling shelf set to build and I’ve largely run out of floor space. The two drawers are quite spacious and kind of deep. I think they will work for large dies like the “Bigz” Sizzix dies, of which I have many. My only concern is that since the drawers are not on rails (they just float in there), I might pull too far for the weight of a heavily-loaded drawer and have an unpleasant experience when they all drop (on my feet, perhaps). I’ll try to be mindful of it, but I also have a small child “helper”, so who knows what might happen – I’m going to try to keep him away from it..
As part of a storage system: Now that I have two cubes, I can check out the stacking aspect. Each cube includes stacking dowels (or caps if you aren’t planning to stack), to make a sturdier tower of cubes. Don’t take that “tower” idea too far, I think they recommend going no more than 3 cubes high. was skeptical at first that the four little dowels would really make a sturdy tower, but it does feel really secure. It took a little maneuvering and patience to get the dowels all lined up just right, it’s a snug fit. In fact, I suspect that if I tried to unstack them, I’d need a helper and maybe a pair of pliers to get the dowels out. I don’t feel like it’s going to tip, the sides are all very flush and smooth, and it looks great as one 2-cube tall unit. Verdict: I’m actually more excited about this versatile cube now that it’s finished than I was about the uni-tasking hanging file cube. Time will tell how well they hold up to the usual craft-room adventures, the rearrangement, and so forth. And time will also tell if those drawers end up causing a problem with heavy paper-cutting dies in them, if I find something lighter to store in their unusual dimensions, or what! Overall, I still appreciate the quality-for-price ratio of the Recollections storage cube line, I think the look is plain but not distracting, and I think their storage versatility means they deserve a place in my craft room. I plan to buy at least one more of them. Update: A few weeks after assembly, I was working with the dies that were stored in the drawers of this combo-cube and I discovered a problem. The shelf just above the drawers, currently holding a couple of12x12″ paper pads, was so bowed by weight that after the drawer was removed, I couldn’t put the drawer back because the shelf above the drawers dipped down into the space required by the top edge of the drawer. Argh! Now, as soon as I removed the paper, I was able to get the drawer back in, so it’s not permanently warped – yet. I don’t think this bodes well for my idea of getting a 4-shelf cube for 12×12″ paper pads. I think the MDF might be too flexible to store such heavy things well. I’ll have to give it some thought. In the box: Various panels, slide rails, rods to hold the hanging files, assembly hardware (screws, dowels), a drawer pull, some decorative screw/dowel hole covers, and 4 hanging file folders. That last bit was annoying, because I couldn’t find on the box anywhere how many file folders (if any) were included. The answer, for mine at least, turned out to be 4 included folders. Maybe the company doesn’t mention it so that they can cheap out later and include just one or something, or maybe they used to include 12 and have already cheaped out! It’s not unusual for companies to be a little vague on the packaging if they plan to make adjustments to the product over time. Some assembly required: Let me preface this comment by saying that I enjoy assembling, following directions, I build with LEGO even as an adult, and I generally like putting things together. I found this FUN to assemble. The parts are all labeled, small hardware is in labeled bags, the instructions are very nice and clear, i.e., attach A to B using screws from bag #8. So easy. Everything was machined very precisely, I had no adjustments to make. The cube assembled flawlessly. I often shop closeouts and thrift stores, and I have picked up another brand of craft storage unit with assembly required that did NOT assemble flawlessly, so let’s say my expectations were not high. I have read a lot of reviews where people were very intimidated by the assembly of this item, or had difficulty with the assembly. I can only say that I had no problems with the one I received. Quality of materials: When I buy a furniture storage item, I expect to get what I pay for. But here’s where I may differ from a lot of people: I expect to pay through the nose for quality. Chain stores don’t EVER put something on sale for a price that they can’t afford. Yes, there is such a thing as a loss leader (an item priced at a small loss to the company to get you in the door to hook you for something very profitable), but this isn’t Walmart and we aren’t talking about a hot toy at Christmas. Michael’s categorically puts storage items on sale often, so if they are putting that category on sale often, it means that they are probably still making a profit even at their frequent sale price. Therefore, I expect a $27 furniture item to be kind of cheap in quality. Thus far, I feel the quality is better than I expected. The panels are made of MDF, which is essentially a nicer kind of particle board (here’s a helpful article on MDF vs particle board vs plywood). MDF is ultra smooth, pretty sturdy, and holds up laminate pretty well. The downside is that like any particle board, the boards have just a bit of give to them when struck or under constant pressure (think of a cheap bookshelf with a bowed board under years of heavy book holding). What this means for the Recollections storage line is that when they pack all those panels into a box, they protect each other a bit, but their corners are a bit vulnerable to the dings and dents of shipping. Especially because the box doesn’t include much padding. If your MDF is compressed by a ding, it’s really easy to chip off the laminate covering. Now I picked up my box at a local store, and was pleasantly surprised when I unboxed it that there were only one or two corners marred by transport to the store, and then only a little bit. Again, I expect to get what I pay for, this is an unsurprising issue common to MDF, I want this for functionality and looking nice is just a bonus, but I know some people SUPER care about this kind of thing. So if I super cared about dings, I would be pretty hesitant to have this shipped from the online store – I just don’t think there’s enough padding in the box unless they put a lot of packing in an overbox. But again, I bought at the nearby store, so I can’t attest to that. Another small quality issue that I believe will bother some, is the peculiar smooth domed hole covers. Among the hardware is included plastic hole caps for the external screw holes, but the one end of the cap is designed to slot into the Phillips-head screw head itself. This is difficult because the screws end up at various heights within their screw holes and can’t necessarily be reached by the plus-shaped end of the hole cap. To check if I had overtightened, I loosened a few screws to a depth for which the caps could reach the screw, but found that this made the connections between panels a little too wobbly for my taste. Luckily, they also include little white vinyl stickers as an alternate solution to covering the holes. This worked just fine, and isn’t terribly noticeable, but again, some people might be disappointed by the look. The drawer pulls out fairly smoothly, not like the action of standard metal office hanging file drawers, but as you would expect for particle board along plastic rails. The hanging files move around fairly well along the metal rods as long as they are not weighed down too much. The folders that were included seem to be able to handle the weight of about one 12×12 paper pad each, more than that seemed to distort the hanging folders. The included folders did not have labels. Supposedly the Recollections 12×12 Hanging File Folders sold separately do have labels. The drawer itself does not have a base, so don’t expect to be able to stand your paperpads between folders of loose paper, there is nowhere for them to stand. Compatibility of file folders: My only real frustration with this unit so far is that I purchased another brand of 12×12 hanging file folders and they did not fit. Buy any letter sized or legal hanging file folders anywhere and they should fit your normal drawer but apparently those rules don’t apply to the world of hanging files for 12×12″ paper. I bought Iris brand, simply because my local Michael’s had them in stock and not the Recollections brand, and they DID NOT FIT. I don’t know if anyone else sells a compatible folder, but from now on I will buy the specific brand and not fiddle with alternatives. As part of a storage system: I haven’t tried any of the others yet, so I will have to update this topic later. I am excited to see that they include stacking dowels, to make a sturdier tower of cubes. Don’t take that “tower” idea literally, I think they recommend going no more than 2 or 3 cubes high. Verdict: Because I don’t have a good place to store 12×12″ paper, I was most excited about this cube from all of those in the set. But without more hanging files, I really can’t say if this unit is sturdy enough to hold enough paper pads to be worthwhile for the kind of paper I usually get. Paper pads are just so dense and heavy. I think this would be great if you had lots of random sheets of loose paper and you wanted to sort by color, but I suspect that if you are a paper pad stasher, as I seem to be, this might not be the cube you are looking for. I do like the general quality of the product, and think it might work very well for loose paper. I will update this post after I’ve picked up more hanging files, and I’ve had more time to live with the Recollections Hanging File Folder cube. Update 9/17/15: As far as I can tell, Michael’s no longer sells the 12 x 12 hanging file folders. The entry is still up on their website, but seems to be permanently “Out of Stock”. I’ve also had no luck at the local Michael’s stores. I never returned the Iris brand ones that did not fit, but maybe I can modify those in some way to make them work. You can be sure I’ll post about it if I come up with a clever solution.